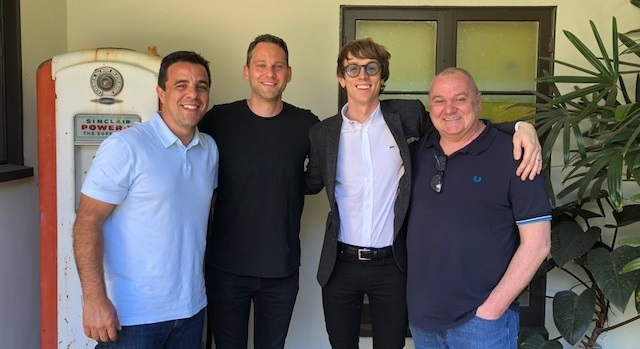 Big Deal Music Group has inked producer/songwriter/musician Jake Sinclair to a worldwide co-publishing agreement. In the photo, Big Deal’s Jamie Cerreta, Casey Robison and Kenny MacPherson form a triple-decker love sandwich around their new signing, while a Sinclair gas pump looms proudly behind them. The Grammy-nominated Sinclair became adept in the art of the studio while engineering for Butch Walker on numerous big-name projects. After writing and producing “Harlem,” his first gold single, with New Politics followed by his first platinum single with 5 Seconds Of Summer’s “She Looks So Perfect,” Sinclair opened his own studio in Echo Park, where he produced his childhood fave Weezer’s White Album and Panic! at the Disco’s chart-topping Death of a Bachelor. More recently, he co-wrote and produced Panic!’s Pray for the Wicked, dropping 6/22. Sinclair, who’s managed by Evan Taubenfeld at Crush, is currently on tour with Beck.